The Grenada Chocolate Festival (GCF) began in 2014, and is doing a great job in combining chocolate with the culinary, culture, and arts scenes of Grenada, earning the Chocolatour stamp of approval for one of the best chocolate events I have attended. 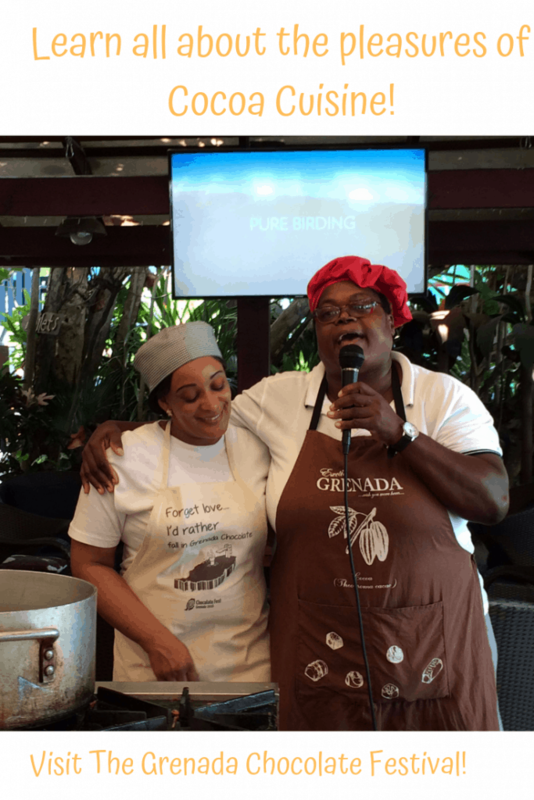 Magdalena Fielden (on the left) is the founder and organizer of the Grenada Chocolate Festival, as well as founder of Grenada’s chocolate museum, the House of Chocolate. She is pictured here with friend Ana Rita Garcia Lascurain of Mexico City, Mexico. Garcia Lascurain owns the MUCHO-Museo del Chocolate in Mexico City. 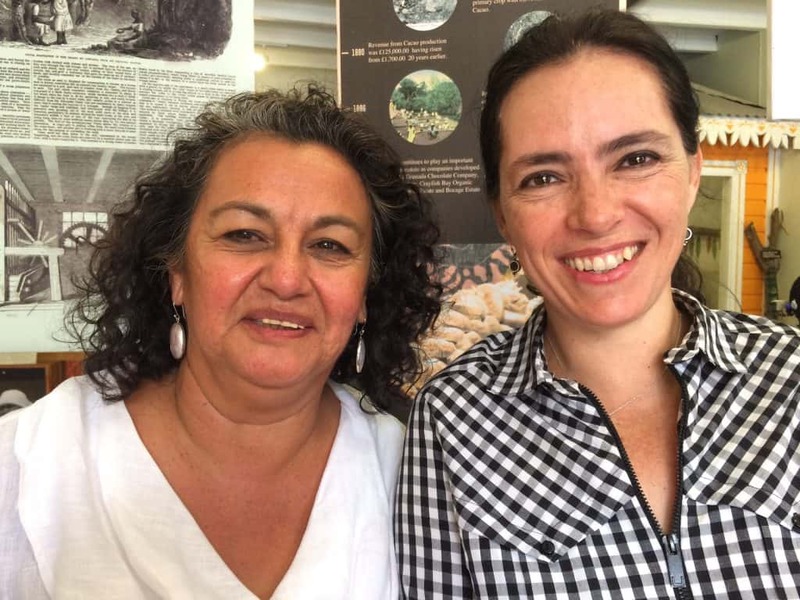 Both women are professional architects of Mexican heritage and have a passion for chocolate. 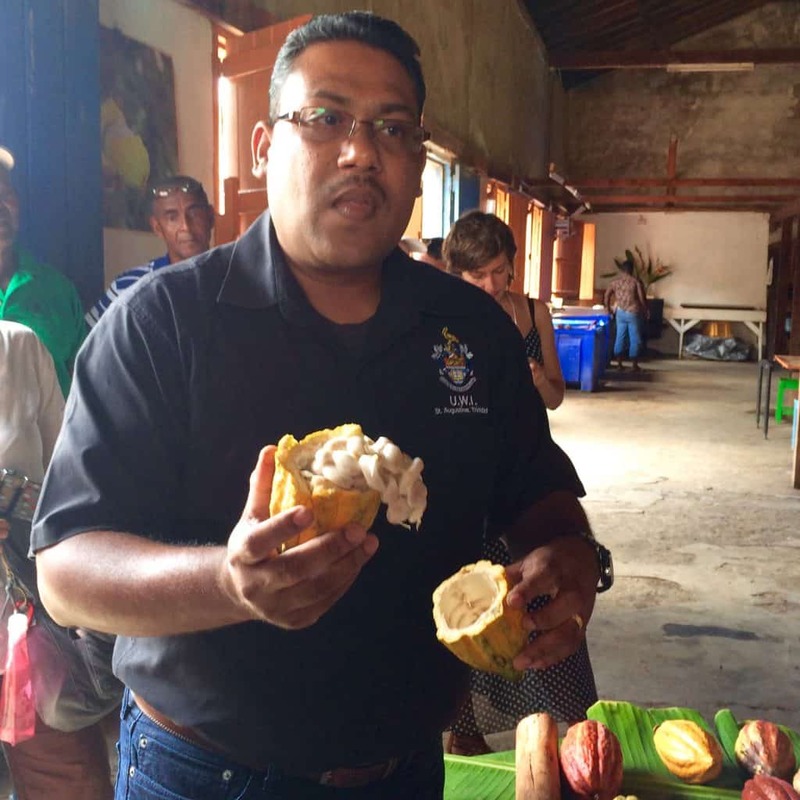 I had the pleasure of visiting the third annual Grenada Chocolate Festival, and was glad I made the epic journey that took roughly 15 hours of travel time through four airports to get from Winnipeg, and then through Toronto, to Port of Spain, Trinidad (the airline hub for the West Indies) and then onto St. George’s, the capital city of Grenada. My sincere thanks to Caribbean Airlines, who upgraded me to business class and made that long journey so much for comfortable and palatable. 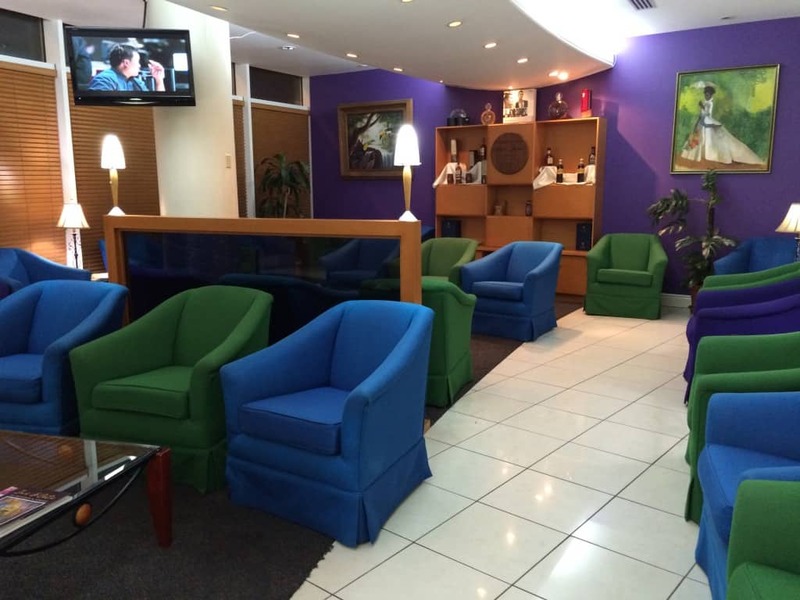 Spending time in the lovely Caribbean Airlines lounge in Trinidad made the wait for my Grenada flight much more comfortable and palatable. 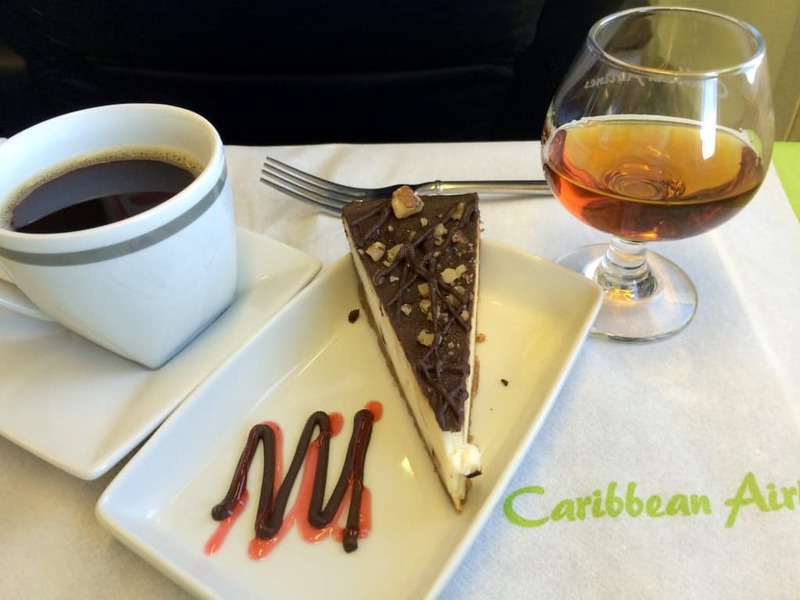 I really enjoyed being pampered by the folks at Caribbean Airlines. While at the Grenada Chocolate Festival, I met a bunch of talented chocolate makers from the Caribbean, the UK, Mexico, and the US. I also met others who are passionate and knowledgeable about the world of fine chocolate. And I ate a ton of great food at various establishments around the island. But we’ll save the culinary highlights for another post. The Grenadian children were thrilled to receive their copies of the “Grenada Chocolate Family” colouring book. In this post, we’ll focus on the goings on at the Grenada Chocolate Fest, so that you can plan a possible visit in the future. The 2016 theme of the chocolate festival was “Creating Generation Cocoa,” with the central theme encouraging a deeper interest in the world of chocolate via a book that was launched during the festival. 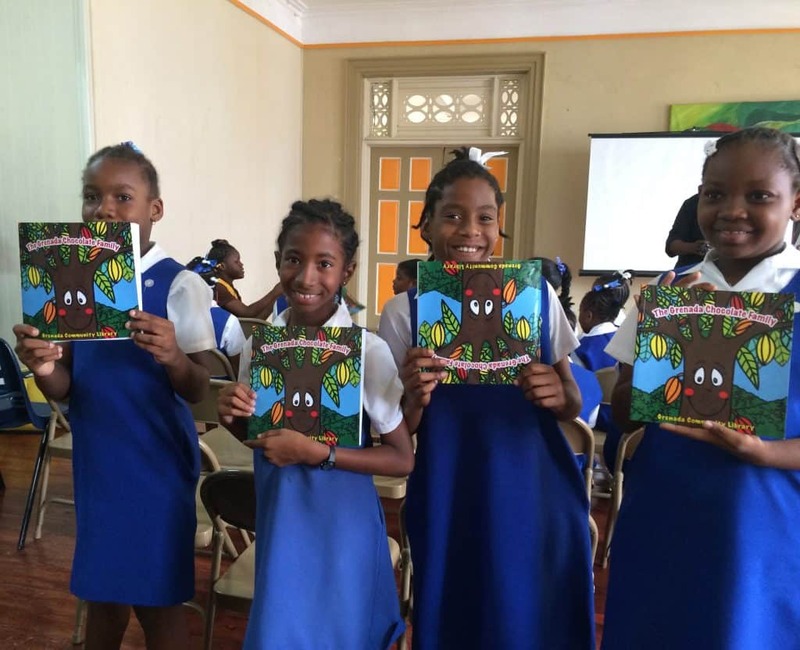 “The Grenada Chocolate Family”–a colouring book for ages six through ten–contains submissions from about 30 Grenadian children on the subject of a cacao tree and cocoa tea, a Grenadian favourite. All proceeds from the book go to support the Grenada Community Library. These pieces of Grenadian art depict how important cacao has been to Grenadian culture. During an evening of the festival, we visited the Susan Mains Art and Soul Gallery. This a fabulous gallery located in the Spiceland Mall in Grand Anse specializing in contemporary Caribbean art. 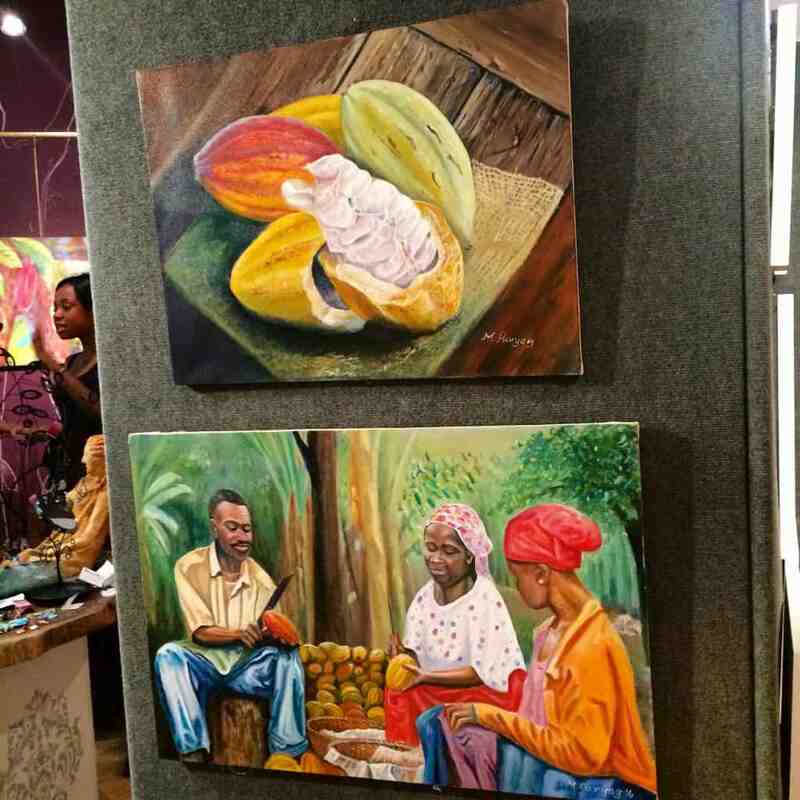 For this special occasion, the art on display was a celebration of cacao and chocolate and Grenada’s connection to it. I loved the vibrant colours depicted in nearly every piece and wished I could have brought several home with me. Dr. Darin Sukha, a Research Fellow from the Cocoa Research Centre explains about how cocoa is grown, harvested, and processed. In its complete immersion into Grenadian chocolate culture, the Grenada Chocolate Festival also included a visit to several cacao farms including the Belmont Estate, located in St. Patrick, an hour’s drive from St. George’s. Here, we learned much about the world of cacao from Dr. Darin Sukha of the Cocoa Research Centre in Trinidad. Belmont Estate is a terrific place to spend the day and learn how cacao is grown and how the cocoa beans are fermented and sun-dried. And yes, there is a chocolate shop where you can purchase bars from the Grenada Chocolate Company, as their chocolate is made with beans grown on Belmont Estate. Specialists in agri-tourism, I would say that the Belmont Estate offers the most comprehensive tour I’ve experienced in the world of chocolate travel, with the perfect blend of fun, learning, entertainment, cocoa cuisine, and culture. 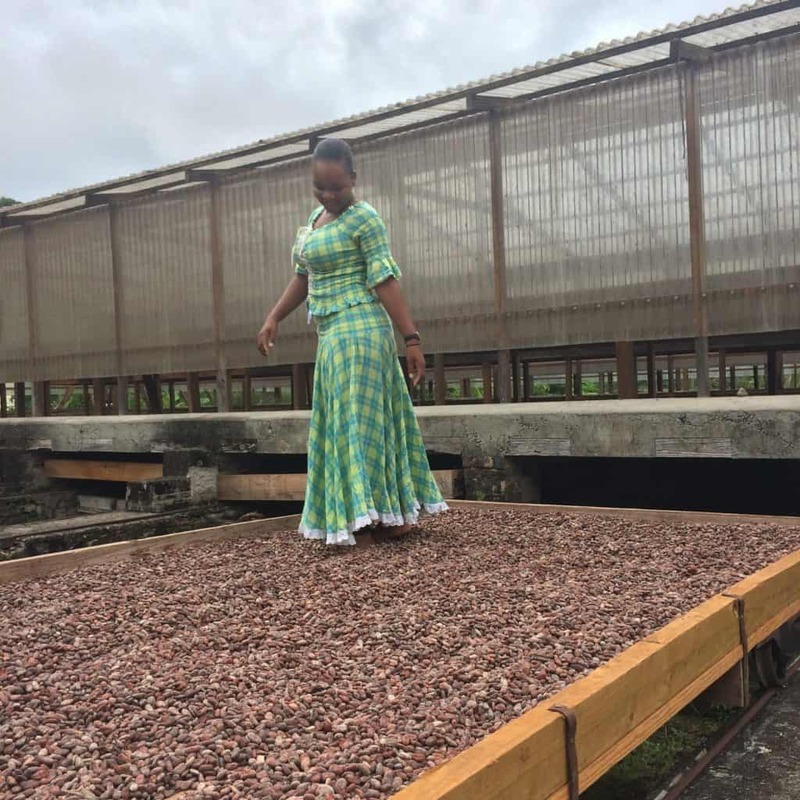 This young lady demonstrates how to “walk the cocoa,” a technique used to turn the cocoa beans with one’s feet so that they will dry faster in the sun. We also learned how to “Dance the Cocoa,” which some of our group gleefully tried. This involves dancing (moving your feet) over the cocoa beans in a large bowl-shaped container housing a thin layer of cocoa beans. You’d have to have pretty thick skin on your feet in order to do this everyday, as the shells of the cocoa beans can feel fairly sharp if your skin has not been hardened. The chocolate festival also included cooking demos, chocolate making demos, and of course … plenty of global and made-in-Grenada chocolate tastings. It was incredible tasting some delicious examples of cocoa cuisine made by the staff at the True Blue Bay Resort who showed us how much fun and how easy it is to cook with chocolate. True Blue Bay is a terrific place to stay and enjoy the Caribbean vibe. The 6th annual Grenada Chocolate Festival runs May 31- June 7, 2019. How I wish I could be there to join in the fun and the flavours. The Grenada Chocolate Festival looks like a lot of fun. I’ve never heard of walking the cocoa. That must have been interesting to see. Did you try it? Hi Donna. No, I didn’t try it as I was nursing my bad knee with baker’s cyst. But I was happy to get lots of great pics, and yes, this is the ultimate festival for chocolate lovers who want to do more than just sample and eat chocolate. Loved it! 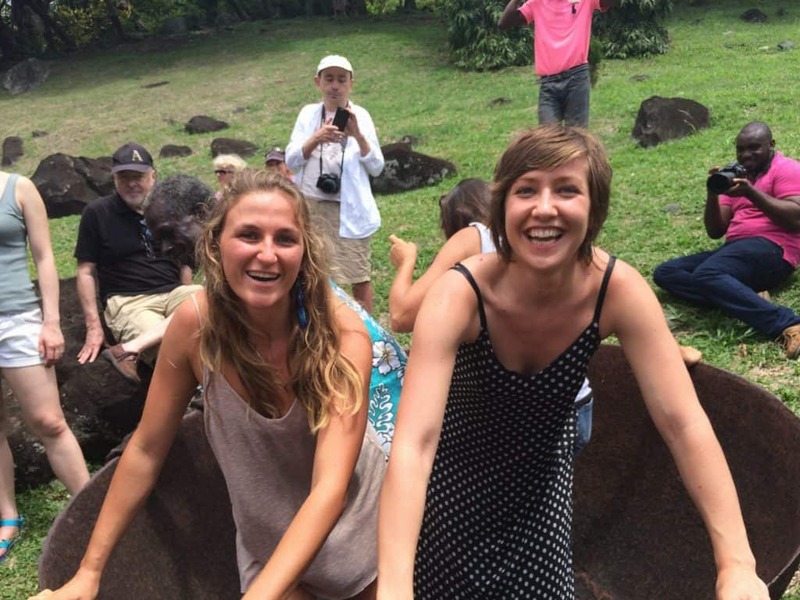 What an adventure you had in Grenada! I am impressed with how happy everyone looks. Everyone has a big smile in the pictures. It appears to be a happy, friendly place to visit with many opportunities to tour various facilities. Are there opportunities for swimming and boating as well? Absolutely, Bev! there are many lovely beaches in Grenada, most notably Grand Anse, which is rated as one of the finest beaches in the world for its fine sand. I was unable to go swimming because of my acute knee condition that was acting up at the time of my visit, but Grenada truly is a terrific place for swimming, diving, snorkelling and boating. I met a lovely gal from Calgary who had her boat moored at the True Blue Bay marina and she intends to be back in Grenada next winter to take people out on her boat. Fascinating post, Doreen. I had no idea that cocoa beans are turned by feet in the drying process. Loved learning about walking the cocoa and dancing the cocoa. Splendid images. Thanks, Linda. Yes, I had heard about Dancing the Cocoa from a tour operator in Trinidad years ago. I guess it’s something unique to the West Indies, as I haven’t seen it done elsewhere. Oh, this is a very cool festival. Far more than merely treats. Love the empowerment of their community and culture through cocoa farming and chocolate manufacturing. That’s precisely why I split the chocolate component from the rest of the experience, TammyJo. I want chocolate lovers to know there is far more to attending some of these amazing chocolate festivals than just eating chocolate. The Grenada Chocolate Fest truly is one of the most fun and most educational chocolate events I have attended. The Grenade Chocolate Festival sounds absolutely fantastic, Doreen. A diversified event that deserves to be a success. Love the photographs. Catarina recently posted…How will Africans get a better life? No idea chocolate was turn by foot, a bit like traditional crushing of wine grapes perhaps? though tougher on the tootsies (feet!) I suspect. It’s interesting to see the plant itself in it’s raw condition. I might have to do some more research about this. I wonder if I could grow it here?! Hi Rosalind and thanks for your comment. Yes, there are many processes in cacao that are similar to dealing with grapes. Many similarities between the worlds of wine and chocolate! I can’t remember exactly where you are located, but cacao will only grow naturally in areas that are 20 degrees north or south of the equator. They are now growing cacao in Hawaii, but that is stretching it at 22 degrees. They are having challenges, but are indeed producing some terrific cacao. Cheers! Doreen, it would have been fun to dance the cocoa or even just walking it. Amazing what we learn from these posts – who ever would have thought that’s what you did to cocoa beans. I’m looking forward to your next book as I assume a lot of this interesting information will be included. For sure, Lenie! The next volume of Chocolatour will focus on the best chocolate adventures of the Americas and the Caribbean. Plus, it will have delicious chapters on pairings, recipes, and chocolate spas, and of course, an expanded version of the global A-Z Guide for Chocolate Lovers! Stay tuned and thx so much for your support. I had no idea the process that goes into making chocolate. It’s interesting to see the lovely activities at this festival. I would love to hear about the recipes that people made with chocolate. The kids would love this. Thanks for sharing your experience, Doreen. Hi Sabrina and thx for your interest. I will have an expanded recipes chapter in the next volume of Chocolatour that will share some interesting options for cocoa cuisine. But to get you started, visit your local Health Food store and buy a bag of organic cocoa nibs. These are small chunks of roasted cocoa beans. They are delish on salads, yogurt, ice-cream, and when crushed, they really enhance the flavour of chili, gravy, and sauces. And they’re a totally healthy snack that your kids can enjoy without any health risk. Let me know what you think! That’s great, Doreen! I will add it to my grocery list and pick some up. Grenada – again?! Not at all envious Doreen! The children look delightful in their electric blue school uniforms. As for the piece of art – it is stunning. Brings home a true picture of the Carribean to me. Did you eat the local food? Roti and curried chicken – hmmm! Oh, yes. We ate plenty of local food, as well as fusion food mixing local and exotic influences. I will discuss the culinary scene of Grenada in a future post. Hi Ken: walking the cocoa turns the beans in the sun so they dry faster and more evenly. Dancing the cocoa just helps to take the shells off the beans and break them up. Hi Marty. Indeed, this trip to Grenada really gave me further insight into the world of chocolate. Each and every chocolate travel journey I have made has enriched my experience in the world of chocolate. I can’t wait for the next one! Hi Doreeen, the Grenada Chocolate Festival looks like find of fun. I hadnt heard of walking the chocolate either. The picture of the girls in the big bowl walking the chocolate made me think of I Love Lucy stomping grapes. 🙂 sounds like grapes are easier on the feet though. Hi, Susan. You are so right! The image of the girls in the big bowl does indeed remind me of the I Love Lucy episode you mention! It was quite the moment! The Grenada Chocolate Festival looks like it was a good time. It must be nice to travel and to see different cultures. It is great that the coloring book benefits the local community. Having said that, the next time I eat chocolate, I’m gonna try to forget that someone might have walked over it with their feet. Erica recently posted…Inflammation: The Secret Reason You’re Gaining Weight! Long journey for a good adventure. I like learning about all the different cocoa entities out there. And turning shelled beans with your feet? Ow! People often comment how lucky I am, because I go to all these medieval faires. I am jealous of you. You go around to fair and festivals and they have chocolate. Thanks for sharing this with us. I can live through your posts vicariously. Thx very much for your comment, William, and also to Rose and Erica for their recent comments. I do indeed consider myself very fortunate to be able to visit chocolate events around the world. It has become my job–and my world. You, too, have created a fascinating field of research for your writing. We are both lucky! The Grenada Chocolate Festival appears as though it was a decent time. It must be pleasant to fly out and to see diverse societies. It is extraordinary that the shading book advantages the nearby group. Having said that, whenever I eat chocolate, I’m going to attempt to overlook that somebody may have strolled over it with their feet.People frequently remark how fortunate I am, on the grounds that I go to all these medieval faires. I am envious of you. You go around to reasonable and celebrations and they have chocolate. A debt of gratitude is in order for imparting this to us. I can survive your posts vicariously. Thnaks for sharing this great articles . You are so right! The picture of the young ladies in the enormous dish does for sure help me to remember the I Love Lucy scene you say! It was an incredible minute! Individuals much of the time comment how blessed I am, in light of the fact that I go to all these medieval faires. I am desirous of you. You go around to sensible and festivities and they have chocolate. How wonderful that the festival has participation from all ages. The book and artwork are so beautiful, and it looks loke everyone, including you, had a great time. Indeed, Christine! Thx to you and the other recent commenters for joining the conversation. The Grenada Chocolate Fest is indeed a wonderful event. It just may be the best chocolate event I’ve attended to date!